Android 4.1.4 on a Samsung Galaxy device! – The figure indicates that it should be the greatest version of Jelly Bean update from Samsung, but hold a minute before you start assuming anything further. 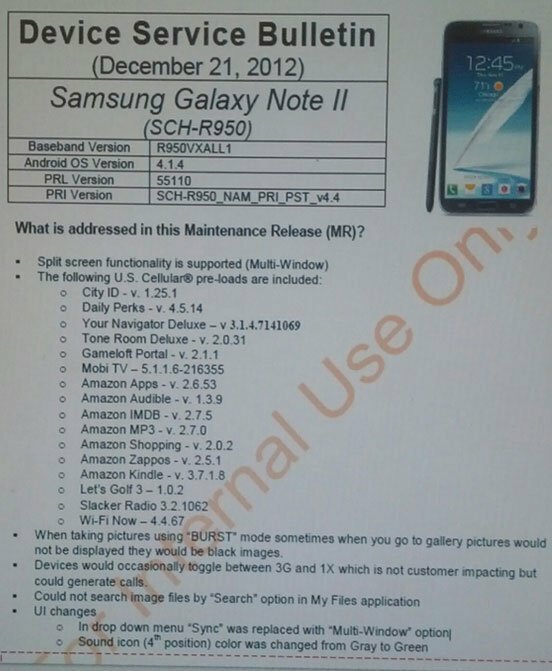 In fact, it is the firmware update version that US Cellular has started pushing to its Galaxy Note 2 users in the United States and which is equal to the regular Android 4.1.2 JB update for Note 2. The Android 4.1.4 update to the device would bump up its baseband version to R950VXALL1 and will bring a host of new features to the Galaxy Note 2 SCH-R950, the most striking of which is the Multi-window/multi-tasking functionality. The new update is now online can be downloaded via the on-device software OTA update feature. You must be familiar with the all the drill if you are not new to it. Anyways, here is the procedure to receive the update.